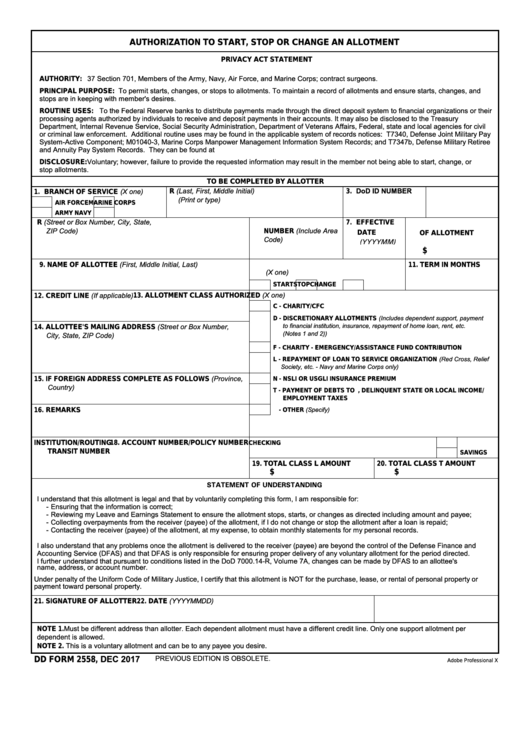 Download a blank fillable Dd Form 2558 - Authorization To Start, Stop Or Change An Allotment in PDF format just by clicking the "DOWNLOAD PDF" button. Complete Dd Form 2558 - Authorization To Start, Stop Or Change An Allotment with your personal data - all interactive fields are highlighted in places where you should type, access drop-down lists or select multiple-choice options. AUTHORITY: 37 U.S.C. Section 701, Members of the Army, Navy, Air Force, and Marine Corps; contract surgeons. stops are in keeping with member's desires. to financial institution, insurance, repayment of home loan, rent, etc. - Contacting the receiver (payee) of the allotment, at my expense, to obtain monthly statements for my personal records. Accounting Service (DFAS) and that DFAS is only responsible for ensuring proper delivery of any voluntary allotment for the period directed. name, address, or account number. NOTE 2. This is a voluntary allotment and can be to any payee you desire.